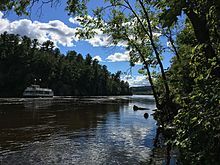 The St. Croix River ( French: Holy Cross) is a tributary of the Mississippi River, approximately 169 miles (272 km) long,  in the U.S. states of Wisconsin and Minnesota. 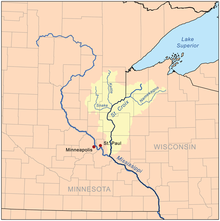 The lower 125 miles (201 km) of the river form the border between Wisconsin and Minnesota. The river is a National Scenic Riverway under the protection of the National Park Service. A hydroelectric plant at St. Croix Falls supplies power to the Minneapolis–St. Paul metropolitan area. Jean-Baptiste-Louis Franquelin's 1688 map recorded a "Fort St. Croix" on the upper reaches of the river. The name "Rivière de Sainte-Croix" was applied to the river sometime in 1688 or 1689, :28 and this more auspicious name supplanted Father Hennepin's earlier designation. At the time of European settlement of the valley, Dakota and Ojibwe were engaged in a long and deadly war with each other. Consequently, the portion of the river below the confluence with Trade River is called Jiibayaatig-ziibi (Grave-marker River) in the Ojibwe language,  reinforcing the earlier "Rivière Tombeaux" name in their language. The river has been home to people for thousands of years. A bison kill site in May Township, Washington County, Minnesota is believed to be about 4,000 years old. [ citation needed] An Oneota village from about 1200 A.D. has been studied by archaeologists. In 1856 construction began on a booming site two miles north of Stillwater, which was used to store and sort the lumber floating downstream and remained in operation for over fifty years. :102 The St. Croix Boom Site is now a wayside rest and National Historic Landmark along Minnesota State Highway 95. 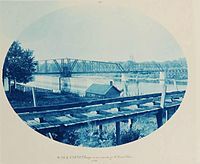 The lumber industry continued to grow throughout the latter half of the 19th century, with progressively larger spring drives and consequent dangers to navigation on the river above Stillwater. Logs were frequently caught in log jams at the narrow Dalles of the St. Croix River, and in 1883 the blockade was so severe it took almost two months before the flow of logs was re-established. :76 At its peak in 1890, logging in the St. Croix River valley produced 450,000,000 board feet (1,100,000 m3) of lumber and logs. The lumber industry continued until the last major log drive in 1912 marked the end of the rich white pine forests of the area. Prescott Drawbridge ( U.S. Highway 10) at Prescott, Wisconsin.